For my birthday, I signed up for a new Fiber Club. Or should I say, Fibre Club, given that the packages are posted from my current fair city. In contrast to the Hello Yarn fiber club, which feeds my ever growing need for a fix of gorgeous handdyed wooliness, this one comes with assignments. And directions. And gorgeous handdyed wooliness. Win-win-win. It's a bit like online spinning school, I guess, but without any deadlines. In any event, the first installment of Spintelligence was a pile of the softest BFL I've ever felt, and the instructions to spin a bunch of small samples of singles yarn, varying the ratios. The idea was to demonstrate how just changing the ratio on the wheel can affect your singles/yarn. Let me back up, just in case anyone reading isn't familiar with the mechanics of spinning wheels. 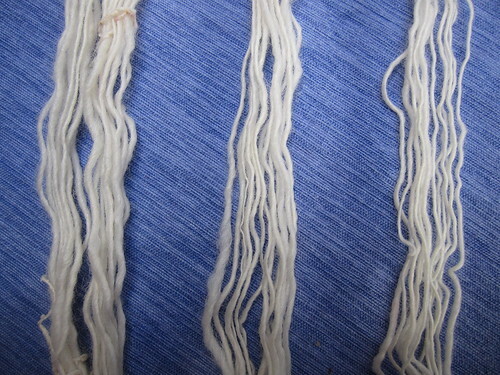 There are a number of different types of "drives" for spinning wheels - aka, different mechanisms to introduce twist into the fiber and then wind the resulting yarn on to the bobbin. But, no matter what sort of drive system you have, there are different ratios for adding twist, which alter how much twist enters the fiber per treadle stroke. The "ratio" refers to the number of times the flyer or bobbin moves (introducing twist) per single rotation of the drive wheel. On my wheel (which is a single-drive, Scotch tension system), the ratios are changed by shifting the drive band from one sized whorl to another. You can see in the above picture that the drive band is going around the smallest whorl on this particular flyer assembly - that gives a higher ratio then the larger whorls. 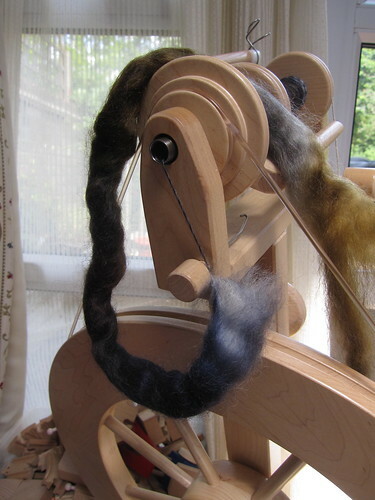 So, armed with the BFL and two flyers with six ratios between them, I set off to do my Spinning Homework. I set the brake tension and spun all the samples at that tension, with a short forward draw without smoothing, and just changed the ratio, going from 6:1 at the top of the picture to 17:1 at the bottom. The obvoius result of this was as follows: higher ratios mean thinner singles with the same drafting and tension. Eureka! Ok, maybe not Eureka!, since this is what was supposed to happen. The only misstep was that the 9.25:1 single had a wpi of 32, while the 12:1 single had a wpi of 28. However, that could easily be due to operated error in measuring wpi. It could also be due to the fact that the 9.25:1 ratio is the smallest on my regular flyer, while the 12:1 is the largest on my high speed flyer, so changing the flyers may have altered the tension a bit. As the ratios went up (and more twist was added per treadle), it became really hard to draft quickly enough to keep the single from getting overtwisted. The sample on the left is 7.5:1, middle is 12:1 and right is 17:1. You can see that, particularly in the 17:1 sample, there's a bit of overtwist that wasn't taken care of in the finishing process. The second part of the assignment was to pick one of the yarns and spin up a bunch of it to knit a swatch. 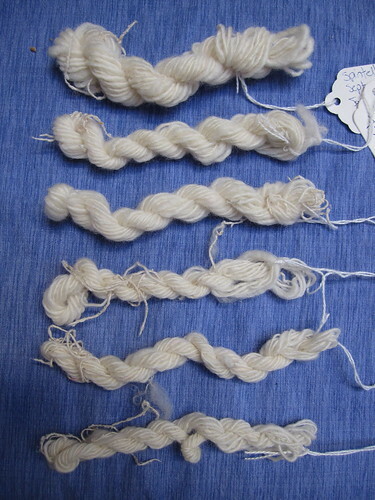 I picked the 7.5:1 sample as my favorite, and spun up about 8 grams of fiber into an unknown number of yards. I picked a US 3/3.25 mm needle for my swatch, by virtue of doubling over my spun yarn and seeing which hole it went through on my needle gauge. 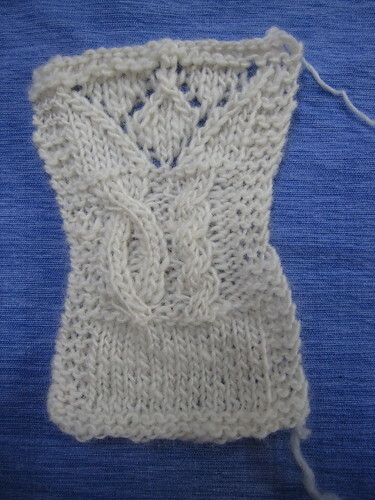 I knit a bit in stockinette, with a garter border, then did a couple of cables, and then a bit of lace. I was pleasantly surprised at how little bias there was in the stockinette section - singles yarn is inherently unbalanced, since it's not plied, and you can end up with biased fabric in stockinette. For that reason, singles are usually best knit up in stitch patterns that combine knit and purl, or in lace. The cables were, unsurprisingly, pretty flat and mushy, and the garter stitch wasn't too good. The lace looked pretty good, although I think I would go up a needle size to make it a bit more fluid - this needle size made for a slightly too stiff lace fabric. The second installment of the club arrived Saturday morning, and I'm itching to get the currently-being-spun bobbin off the wheel so I can get to work on it. The assignment this time is another singles yarn, but this time in some gorgeous handdyed alpaca/merino from The Thylacine. Written by porpoise On October 19, 2010 In "Spintelligence", "fiber club", "spinning"